← We Give You an Enlightened Comment with regard to Men and Women Competing Against Each Other!! SHUFFLEBOARD EXCITEMENT by Earl Ball. 2018 04 15. Birthplace of Hockey Added by Doug Stockman. SHUFFLEBOARD EXCITEMENT by Earl Ball. 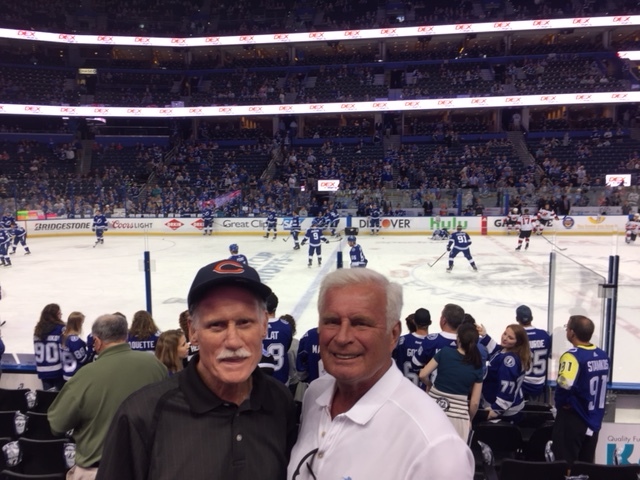 Mike Seyfer and I went to a Hockey playoff game last Thursday between The Lighting and the Devils. Now Mike doesn’t know much about Hockey and of course I’m somewhat of an expert; I’ve been to a couple of Hockey games, I have friends that are Canadian and I’ve played Shuffleboard on a Hockey Court as proof of my Hockey knowledge so I was able to explain to Mike what was going on. Man, do they play on a big court and the biggest difference between hockey and shuffleboard is they have races from one end of the court to the other and the fans get really excited to see who will win the race; maybe we should have races. They also only play with one disc and they really bat that thing around; talk about hard shooting. Hockey allows for a kitchen guard and he really limits the kitchens because he is as big as any football player you’ve ever seen and even wears more equipment. The game is really fast, the players run over each other and the fans are really loud; similar to what you see at a shuffleboard match. It was great fun and I’m glad I understand Shuffleboard or I wouldn’t know what was going on. Earl 4-14-2018 Stan Speaks: I now give you a short read about the atmosphere which exists in NHL Hockey Games to-day: HOCKEY IS CANADAup 2018 04 14.
takes a great imagination. Earl, I enjoyed reading your attempt . All the best to both of you . 1 Response to SHUFFLEBOARD EXCITEMENT by Earl Ball. 2018 04 15. Birthplace of Hockey Added by Doug Stockman. I’ve always said the lack of excitement during our games truly hinders our growth. Being out on the courts with 20 players to a side and hearing nothing but whispers reminds me of being in a funeral parlor with an outstretched dearly departed. A few times when I actually clapped for my partners great shot I was stared down and scolded by the shooters on courts on either side of me.